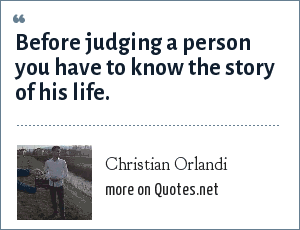 Christian Orlandi: Before judging a person you have to know the story of his life. "Christian Orlandi Quotes." Quotes.net. STANDS4 LLC, 2019. Web. 25 Apr. 2019. <https://www.quotes.net/quote/66666>.